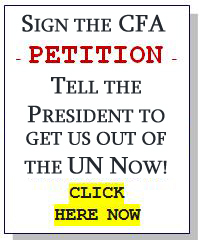 A national survey of 25,000 supporters of Americans for Sovereignty® revealed intense opposition to the ratification of a series of treaties that the Obama Administration is expected to urge the Senate to support as part of its efforts to bring the United States into a transnational legal framework. Even since the elevation of Prof. Harold Koh to be the chief legal advisor at the Department of State, the Obama Administration has indicated its strong support for numerous treaties that have languished in the Senate for the past decade or more. But in the Americans for Sovereignty® survey, strong opposition existed to all of these treaties due to the threats they pose to American sovereignty. Over 90% in the survey opposed the Law of the Sea Treaty that would give a quasi-U.N. agency authority over the seas, including taxing of American companies. A similar margin also opposes the UN Women's Rights Treaty, which in other countries has already led to demands that prostitution be legalized and Mother's Day abolished. The survey also found that American security would be threatened by the ratification of the Comprehensive Nuclear Test Ban Treaty. This would bring a unilateral halt to testing of American nuclear weapons but do nothing to halt rouge states such as Iran and North Korea from continuing their nuclear weapons programs. Nearly unanimous opposition also existed to the adoption of the so-called Kytoto Treaty and Global Warming which would hamstring the American economy with onerous and unnecessary environmental restrictions that would not be imposed on the most rapidly expanding polluters on the planet, India and China. Finally the survey found 98% of respondents opposed to the United States joining the International Criminal Court which could lead to the prosecution of American servicemen stationed overseas who would be denied basic American Constitutional protections. Overall the survey found that the American people reject the efforts of the Obama Administration to ratify treaties that would only threaten the American economy and diminish American sovereignty. Americans for Sovereignty® is a project of Council for America®. With over 25,000 supporters, it is one of the largest organizations in the United States that focuses its attention on issues affecting continued American sovereignty.